I have never experienced a big top with lions, monkeys or Asian elephants, but the thought of exotic animals performing under the circus tent makes me sick to my stomach. Animals featured as an actor in the circus may seem like marvellous fun to many, but there is a very dark reality to circuses both here and around the world. Circus animals such as lions, elephants and monkeys are held captive in small cages that obviously don’t come close to their natural environment or the distances they can travel. Animals are stuffed into trains and trailers and carted from town to town to perform demeaning tricks; this is an unnatural life for these majestic animals. Elephants in the circus are forced to perform demeaning tricks such as standing on their head and dancing. Elephants have been known to be beaten by bull hooks and tortured as babies to learn to obey their trainers. Lions are the kings of the jungle but at circuses, they are nothing more than slaves being humiliated in front of crowds of screaming children. Animals at the circus are not performing because they want to, they are performing because of being forced to line the pockets of those who just want to make money. In Australia, thankfully there are only two exotic animal circuses left and animals such as elephants and tigers have been phased out. However, lions and monkeys are not so lucky as they are still forced to perform demeaning circus tricks at Stardust Circus and Lennon Bros Circus. These circuses claim that the lions are the equivalent of pets and that the wild has been bred out of them over the many years of captive breeding, but the truth is that the wild can never really be taken from wild animals, despite what the Australian circuses claim. The attitude of the public is clearly changing as families are becoming more aware of the cruelty inflicted on animals in the circus for our entertainment. In 2007, a Stardust Circus worker was killed by Arna, one of the circuses elephants, while Stardust Circus was in Yamba on the North Coast. Wild animals in circuses and zoos often make headlines when they finally snap and attack their trainers after years of captivity and abuse. One elephant’s tragic life was made famous in the 2015 documentary Tyke Elephant Outlaw that investigated the death of Tyke, a captive elephant that went on a rampage in Honolulu and ran into the streets where she was shot by police 87 times and died slowly and painfully. The attitude of the public is clearly changing as families are becoming more aware of the cruelty inflicted on animals in the circus for our entertainment. On 21 May 2017, the longest running and largest animal circus in the world, Ringling Brothers and Barnum and Bailey, had its last ever performance after a long 146 years. 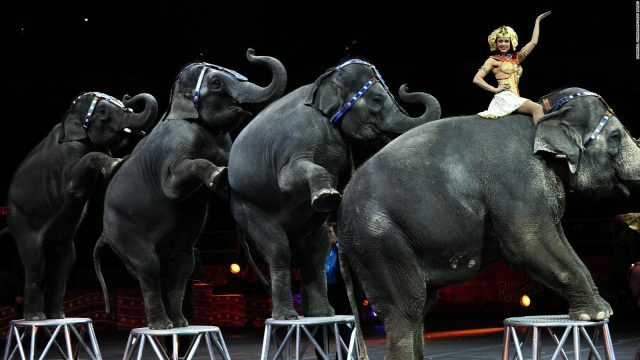 The company even credited the demise of the circus as partly due to animal rights groups. In June 2017, New York City banned exotic animal circuses due to the safety of the public and animals. In Australia, many councils have banned wild animal circuses due to pressure from the public and animal rights groups such as Animal Liberation, which has been lobbying for years and won’t stop until every circus cage is empty. Circuses can still function and be popular without using animals for entertainment. There are many animal-free circuses in Australia and worldwide that thrive because the public wants cruelty-free entertainment. I will never visit a circus that uses animals because captivity is simply cruelty. I will instead continue to protest Australia’s last remaining animal circuses and advocate for families to support the animal-free circuses.